The Brewers were wearing their Cerveceros jerseys yesterday (here’s a better view), but the best uniforms in this photo are the ones worn by the sausages. I love the sausages. I saw the race at a game 2 years ago, quite good. They should wear sausage unis to honor the best entertainment in cheeseland. At the risk of sounding like an idiot….who/what are “Cerveceros”? Actually, #3 looks like the White Sox “Leisure Suit” style. Good pics here including a good shorts pic. Could this be the first Soccer style jersey sponsorship in Baseball? Could this be the first Soccer style jersey sponsorship in Baseball. Well, maybe one of the few things I retained from High School/College Spanish classes was that Cerveza means beer. Therefore, I can only assume that Cerveceros means Brewers. With my limited knowledge of the Spanish language I believe Cerveceros means Brewers in Spanish, funny that the brew crew are on here I just ordered their old Cooperstown T, to go with my Orioles one too. Im Dominican(and obviously speek spanish) and indeed Cerveceros means Brewers. I wonder if the Marlins, Diamondbacks, Rangers, and Astros will ever try the Spanish uniforms since they are located close to Hispanic areas. I like how the Giants and Brewers have changed the spelling while keeping the integrity of the uniform with the same colors and fonts. the only problem is that the marlins and the astros are called the same in spanish and in english. Anyone ever notice that Digger Phelps of ESPN’s College Gameday has a hilighter that matches his tie, no matter what the color is. Orange, Lime Green, Yellow (Last Night) among others. I can’t find any pix though. Is there a large Latino contingency in Wisconsin? I guess that’s where the spanish jerseys really lost me. Will the Padres try out English jerseys? So does “Sox” translate to Spanish? Obviously socks does but sox? I guess the White Sox would just be the Sox bloncos and the Red Sox the Sox rojos? “The Los Angeles Angels of Anaheim” into English, you get “The The Angels Angels of Anaheim”. Erm.. socks is Calcetines. But something sounds wrong with “Calcetines Rojos”. I think we should possibly adding Hector Carrasco to the list of new BP cap dissenters. The Rangers actually did do a Spanish jersey which looked ridiculous. Here it is. Also, is it fair to say that any jersey in the MLB online store is the final version for the 2007 Season now that Spring Training has started? I found it here though. Can’t wait to see the powers that be try to put “Nacionales” in that crazy font we use in D.C.
As a former resident of the city I can say that there is indeed a large Hispanic population mostly on the south side of Milwaukee. I was surprised to find that out too. He’s been doing that for years. It’s his signature, as much as Lee Corso with the pencil and Herbsreit (sp?) with the sharpie. I happened to be watching the Colorado Avalanche-Detroit Red Wings game on NBC today, and noticed that John-Michael Liles is wearing #4. Liles used to wear #26, but he gave that to Paul Stastny whose father, Peter Stastny, wore the number while with the Quebec Nordiques. He chose #4 after Rob Blake left since he’s worn #4 since he was 14. Stastny actually wore #62 before that. I hope I didn’t ruin anyone’s Avalanche jersey by bringing this number swap to light. A) Why and for how long has it not been working? B) Why does it have the same note left by Paul when Uniwatch was down? C) When’ll it be back up? Digger has always had his own flair, going back to his colorful carnations he wore on his suit when he coached at Notre Dame. Many have affectionately dubbed his highlighter/tie combo the “tie-lighter”. During march madness final fours and finals he matches his tie lighter to the teams he believes will win. I was at college game day yesterday at Marquette and I noticed that he ciarried several different highlighters in a specific case. I think he wants always be ready for any situation I guess. But on a different note, I can’t believe the Brewers or Cerveceros added another sausage. Being from Milwaukee I was just getting over the addition of the Hot Dog. It will be a while before I warm up to the new guy. I’ve also seen the Rangers translated as “Centinelas”, witch means Guards. They call the Twins “Mellisos” because Gemelos means identical twins, as oposed to plain twins. The Brewers sell a Cerveceros T-shirt (same font on dark blue), but no Cerveceros jerseys. Go figure. I have a question, What is with the spanish jerseys? Is this something MLB is trying out? I think they realize that baseball is HUGE in the Hispanic community and this is a way to reach out to that community. 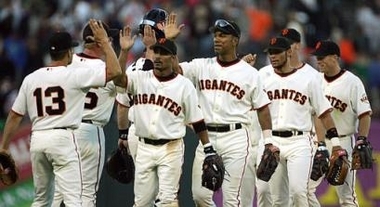 It’s a little heavy-handed and obvious, yes, but I still applaud the gesture–mostly because the Gigantes’ unis look pretty good. In the case of the Padres, the name actually translates to FRIARS not Dads. The sleve patch of the “Swinging Friar” might be a hint. We can add Greg Paulus to the list of wearers of the body armor under the jersey. and on the only uni related part of this post: I can’t wait to see what the ‘heels’ (thats wierd) new uni for the tourny look like….please don’t loose the argyle.. I knew “Medias Rojas” was accepted, but I didn’t realize it was this official. Too bad it’s such an ugly shirt. Louisville decided to go with their red uniforms on senior day (which I think are their alternates, since they’re quite fond of the black unis on the road). While a home team wearing a color isn’t unprecedented, Seton Hall played in their white home unis. This is the first time I can remember something like this happening outside of hockey and football ( the American or the Association kind). I just finished a blog on hockey’s promotional jerseys. I’ve discovered that there are some hideous jerseys out there. You can read it here if you have a few moments. Be prepared for some hostility on your eyes. Unless he’s a giant wuss, he’ll be fine. The refs blew that call six ways to Sunday. As for changing unis for the tourney, that’s dumb. Of course, I hate black alternates so I suppose it’s only natural that I’d hate gimmick unis for the tourney. Milwaukee does indeed have a large Hispanic community and a lot of it is actually located right around Miller Park. The majority is of Mexican decent, but there are other nationalities as well. Baseball actually rivals soccer in many Latin American countries for popularity. I’ve been told, as well, that it’s appeal has a lot to do with the ability to “get out” and move up in life. You sign a baseball contract, it’s big money and you’re moving to America. With a soccer contract, you are still in the same country. Anyway, you can get Brewers games in Spanish radio and sometimes games aren’t on local English-speaking TV, but they are on local Spanish TV. Part of solving the server problem was that Ditch the Black had to be temporarily suspended. I honestly don’t know or understand why that particular message is there (webmaster John Ekdahl handles that stuff), but yes, we’re aware of it, and yes, it’ll eventually be fixed. [quote comment=”58376″]I just finished a blog on hockey’s promotional jerseys. I’ve discovered that there are some hideous jerseys out there. You can read it here if you have a few moments. As an aside, Paul, how many signatures do you want/need before you can present it to the Mets? This has probably been mentioned before but I can’t justify digging through the comments, why are the Yankees wearing a black band on their home jerseys? As seen here. I would guess the Yankee armband would be for Cory Lidle. Unfortunately, it’s been an annoying practice in my opinion that happens quite too often. One such example would be the 2/23 Cavs-Bulls game in Cleveland. The Cavs wore their orange throwbacks while the Bulls wore their white jerseys ON THE ROAD… ANNOYING. I really enjoyed your blog. Your right, The Mudbugs jersey(sweater?) is hideous. They are wearing one that is somewhat better now. I’m trying to find a picture of the Mardi Gras design. That will really throw you for a loop. In his first start for the Bruins, Joey MacDonald was wearing his old Red Wings equipment, complete with the Red Wings symbol still on his mask. I hope he gets that fixed soon. Yes, the armband is in memory of Lidle. Info in this article from the Yankees’ website. The classic example of this was Johan Hedberg, who wore his blue Manitoba Moose mask when he was traded to Pittsburgh. People noticed, fans would chant “Mooooooose” when he made a big save, it became his nickname, and his black-and-gold mask still said “Moose”. I even have foam “antlers” that the Penguins gave out at a playoff game. Teebz, excellent entry. I particularly like the Laredo Bucks’ Halloween jersey. I thought the cow was funny, but just not right for a jersey. As for the Valentine’s Day jerseys, well, the less said, the better. I don’t like the idea of having the Spanish names on jerseys. I think its kind of dumb. Yes the leauge is highly influence by the Spanish community, but if they are going to have Spanish, they should have all languages. Or, in my humble opinion, just stick to english. I don’t get whats so special about them being in Spanish. Just furthering the trend that Spanish is becoming more and more influential as a language over english unfortunatley. But that is neither here nor there. This is sports. I love that site with the hockey jerseys. There are some crazy ones in the minor leagues for the special days. I wish the NHL wasn’t so uptight with all the rules about everything, I would love to see some Christmas jerseys. As for the Bruins goalie wearing Red Wings stuff, I see that often and find it funny. When a player comes up from the minors it is really common too, it looks rediculous sometimes. [quote comment=”58395″]I don’t like the idea of having the Spanish names on jerseys. I think its kind of dumb. Yes the leauge is highly influence by the Spanish community, but if they are going to have Spanish, they should have all languages. Or, in my humble opinion, just stick to english. I don’t get whats so special about them being in Spanish. Just furthering the trend that Spanish is becoming more and more influential as a language over english unfortunatley. But that is neither here nor there. This is sports. I think it is very cool, as someone mentioned before the Giants and Brewers pulled it of beautifully since it matched the fonts perfectly. But in cases like the “Los Rangers” jersey…….well it looked plain bush league. So it is perfectly fine for teams to acknowledge Irish tradition and make their uniforms green? Hispanics are a bigger minority if that is the case. [quote comment=”58399″][quote comment=”58395″]I don’t like the idea of having the Spanish names on jerseys. I think its kind of dumb. Yes the leauge is highly influence by the Spanish community, but if they are going to have Spanish, they should have all languages. Or, in my humble opinion, just stick to english. I don’t get whats so special about them being in Spanish. Just furthering the trend that Spanish is becoming more and more influential as a language over english unfortunatley. But that is neither here nor there. This is sports. Well said. Of course, the Emerald Isle is such a hotbed of baseball! um, are these really the new nike uni’s everyone was talking about? hideous. I thought teams only had one BP jersey, and one BP cap (other than Detroit, of course, with the navy/white and navy/orange home/away scheme). Is Boston going to use the blue jerseys and caps for away games, and the red/red for home games? The blue jersey does say “Boston,” while the red jersey says “Red Sox.” At least they got New Era to synchronize the hat color and faux do-rag on both hats. Looks like Jarrod Saltamacchia borrowed some batting gloves from Chipper Jones. These pics from MLB 2K7 show the Phillies jerseys have “Phillies” underlined. Does this accurately reflect a uni change or is it a mistake? 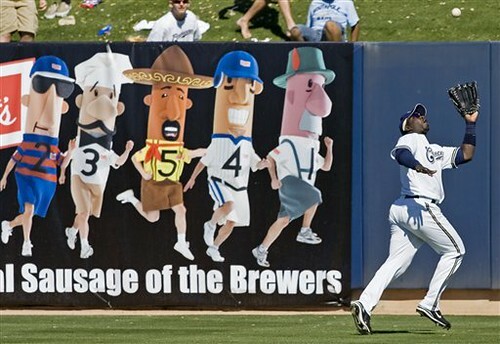 So the Brewers are now officially adding the Chorizo to the sausage race lineup? Last I heard, they had tried to introduce the new sausage, but MLB told them to stop, since they had to approve of all mascots. MLB stopped them from using the Chorizo last year because they felt it was an attempt to increase merchandise sales in the middle of the season. As far as I understood it, they knew the Chorizo wouldn’t be allowed last year because of MLB licensing. They introduced him and had a press conference and he ran on Cerveceros Day, but I thought we always knew that he wouldn’t be a full-time sausage until this season.